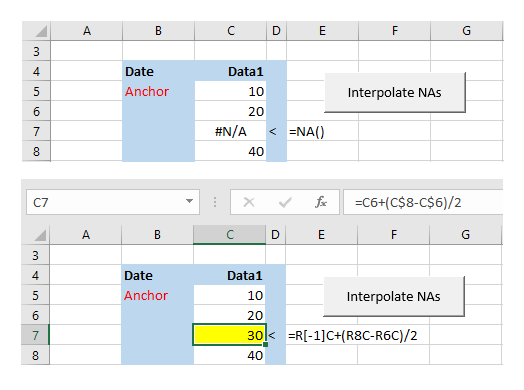 The objective is to replace #N/A errors in a data vector (figure 1 top panel) with formulas returning the interpolated value (figure 1 bottom panel). The VBA code is provided in the next section. Code 2 resets the Data1 range (Range("Anchor").Offset(0, 1)) by copying the replacement data from the TestData range. The Paste argument (line 46) overwrites the Yellow Fill color from code 1 line 30.